Klein was raised in Brookfield, Illinois. He is of German, Irish, and English descent. His mother, Terese (née Bergen), is a kindergarten teacher, and his father, Fred Klein, is an engineer. Klein was the second of three children. His older sister, Debbie, was born in 1978 and his younger brother, Timothy, was born in 1982. As a child, Klein had his first on stage experience by singing This Little Light of Mine in a community theater at the Sheraton Convention Center in Chicago. He lived in the town for thirteen years before his family moved to Omaha, Nebraska. At Millard West High School in Omaha, Klein acted in his high school's performance of West Side Story, played cornerback and linebacker for the football team, and swam on the Millard West Swim Team. In his senior year, Klein was offered his first professional acting job by director Alexander Payne, who was scouting Omaha, his hometown, as a potential filming location for the film Election. He attended Texas Christian University (TCU) in Fort Worth, Texas. After auditioning for Election, Payne chose Klein and they began filming. The film was released in April 1999 to positive reviews. Soon after, Klein found a steady amount of work in the film industry while briefly attending TCU, where he studied theater and was a member of the Lambda Chi Alpha fraternity. He was next seen in American Pie, acting as Christopher Russell Ostreicher, which opened on July 9, 1999, and was a box office success. The following year Klein starred in Here on Earth alongside LeeLee Sobieski and Josh Hartnett (2000). Klein reprised his role in American Pie 2 (2001) and American Reunion (2012), but was not in American Wedding reportedly due to scheduling conflicts. In 2002, Klein had a role in the Mel Gibson Vietnam War film We Were Soldiers. Klein starred in the 2002 remake of the film Rollerball, but the film was a massive critical and financial failure. Klein has also appeared in several teen movies, including Just Friends (2005) and American Dreamz (2006). In 2014, Klein was cast as an American pilot in the Damien Lay film The Uberkanone. He co-starred in the 2014 comedy indie film Authors Anonymous with Kaley Cuoco. In 2018, Klein was cast as Cicada, the main villain of the fifth season of superhero television series The Flash. In January 2000, Klein and actress Katie Holmes began dating. The couple became engaged around Christmas of 2003. The couple called off the engagement and ended their relationship in March 2005. Klein met Laina Rose Thyfault, a travel agent, in 2011 at a mutual friend's wedding. They got engaged in December 2014 after three years of dating and married eight months later on August 9, 2015 in Montana. In March 2016, Klein announced in a tweet that he and his wife were expecting their first child together. Their son was born in 2016. The couple also have a daughter, who was born in 2018. Klein was arrested for drunk driving on February 5, 2005 in San Diego County and again in Los Angeles on June 16, 2010. On June 21, 2010, it was announced that Klein had checked into the Cirque Lodge to begin a 30-day alcohol addiction program. Klein's publicist explained that "after recent events, Chris was forced to take a clear look at a problem he has been trying to deal with himself for years. He understands now that he cannot beat this disease alone." ^ "'American Pie' star Klein to be arraigned". Usatoday.Com. 2005-04-14. Retrieved 2016-08-17. ^ "Chris Klein Biography (1979-)". Filmreference.com. Retrieved 2016-08-17. ^ August 01, 2001 (2001-08-01). "Bergen - tribunedigital-chicagotribune". Articles.chicagotribune.com. Retrieved 2016-08-17. ^ "Rollerball (2002)". Box Office Mojo. ^ Jeff Sneider (7 January 2014). "Chris Klein, Victoria Summer to Star in WWI Thriller 'The Uberkanone' (Exclusive)". The Wrap. Retrieved 18 February 2014. ^ Jerrica Tisdale (15 February 2014). "Kaley Cuoco Plays Author in New Romantic Comedy with Chris Klein". Web Pro News. Retrieved 4 March 2014. ^ Romano, Nick (21 July 2018). "The Flash season 5 casts American Pie's Chris Klein as the next big bad". Entertainment Weekly. Retrieved 21 July 2018. ^ Hipes, Patrick; Hipes, Patrick (22 July 2018). "'The Flash' Casts Chris Klein As Season 5 Villain Cicada – Comic-Con". Retrieved 13 January 2019. ^ "Katie Holmes and Chris Klein Split Up". People.com. Retrieved 2016-08-17. ^ "American Pie Star Chris Klein Weds Laina Rose Thyfault in Montana". People. August 9, 2015. Retrieved August 9, 2015. ^ Marquina, Sierra. "Chris Klein, Wife Laina Rose Thyfault Welcome First Child — See the Adorable Photos!". UsMagazine.com. Us Weekly. Retrieved December 25, 2016. ^ Harrison, Lily (March 15, 2016). "Chris Klein Is Expecting His First Child With Wife Laina Rose Thyfault". E! Online. Retrieved April 5, 2016. ^ "Chris Klein Welcomes Son". E! Online. July 27, 2016. ^ "Chris Klein Faces Drunk-Driving Charge" Los Angeles Times, April 13, 2005. ^ "'American Pie' Actor Chris Klein Arrested on DUI Charge." Los Angeles Times. June 16, 2010. ^ "Chris Klein Checks Into Rehab" People. June 21, 2010. 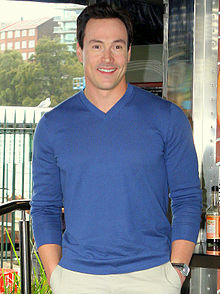 Wikimedia Commons has media related to Chris Klein.